Traduit depuis l’article original : Panorama des médias sociaux 2011. Social media is a rich ecosystem with perpetual evolution. A very good thing for users who can benefits from a large array of online services and social platforms, but a jigsaw for brands and marketers which have to face audience fragmentation. « Audience fragmentation », even with Facebook toping at 600 millions users? 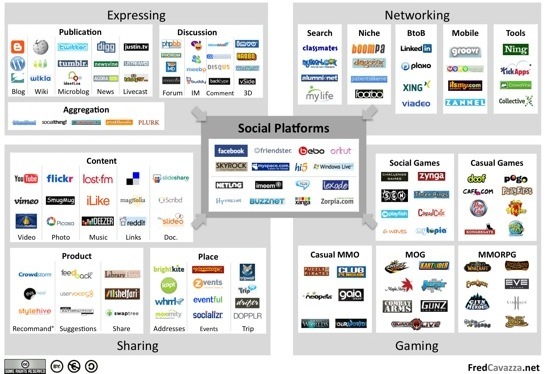 Yes indeed, because if Facebook is by far the most visible, users are generally using more than one social platform. Most of the time, average users are happy with Facebook’s large panel of functionalities, but hipsters and opinion leaders turn to different social online services. In this second version I identified 4 main families of usage with 17 sub-families. I also started to introduce the idea of concentration on social platforms wich provide nearly equivalent functionnality but in one single (and convenient) place. 2010 was such a messy year for social media that I gave up the idea of publishing a third version. I indeed had a really hard time trying to elaborate a new classification since I was some new and disturbing social phenomenon like 4chan (a forum where you can share pictures anonymously), Ffffound (an invitation-only photo sharing service), Blippy (a service to share every purchase you make with your credit card) or the infamous Chatroulette. Please note that this landscape was made in parallel with a similar project (also on third revision): The Conversation Prism. This prism is indeed a very good job, but I am not perfectly confortable with the classification (the Virtual Worlds slice is too approximated). Games, where you can find traditionnal players from casual gaming (Kongregate, Pogo, PopCap, PlayFirst), but also new comers from social gaming (Zynga, Playfish, Playdom, SGN), as well as mobile gaming (ngmoco, OpenFeint) and virtual worlds for tweens (Habbo, Club Penguin,Poptropica). What a nice collection of links! Once again, the aim of this chart is not to have an exhaustive list (otherwise the chart won’t be readable) but to give you a sharp overview of what type of services social media are made of. 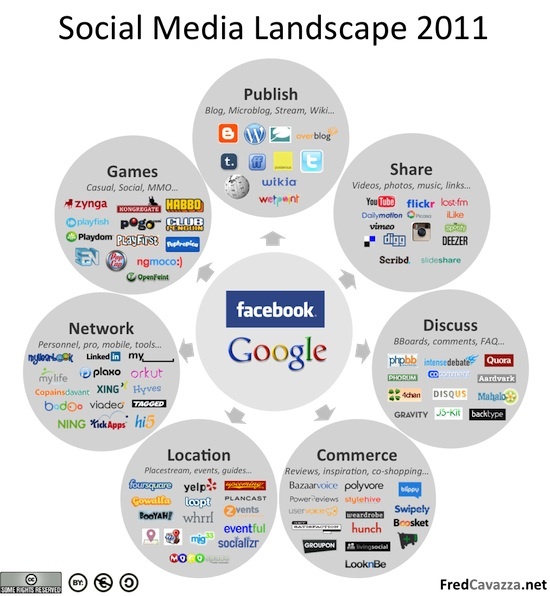 And within this overview, three players manage to grab full attention: Facebook, Twitter and Google. As you can see, Facebook and Google are able to compete with historical players, new comers and local players (mainly in France). For now, Google is still (relatively) quiet on the social field because his offering is spread on several platforms / brands, but the mysterious « +1 » project should link all these services into one unique social layer. Twitter manages to be present on most of the uses thanks to third-party services and a very dynamic ecosystem. So for now Facebook is the true and unique Godzilla with the widest (but not necessarily the most original) array of services. Indeed, Facebook can be seen as the mall of social media: a convenient place where one can find every services offered elsewhere but in a single location. As it is not the first time I try to map social media, I will not make any prediction on what will happens next. I remain nevertheless deeply convinced that relying your social strategy on Facebook alone is a very reductive approach. All the various online services available provide a much greater richness and more subtle social mechanisms. Taking the time to study all those will help you acquire a most sharper understanding on how social media works. I was wondering why Yammer is not present in your landscape? @ Jos > Because Yammer is for internal use, it is not public. 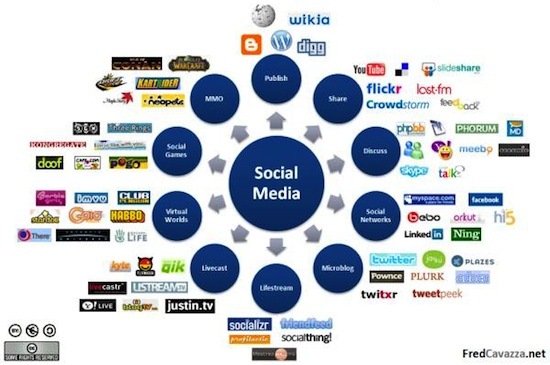 I love your diagram it really simplifies the Social media tools, I am writing a book on social media for business, coming out in a few months, could I have permission to publish this diagram in my book, I will give you the necessary credit. These schemes are like lents on my camera allowing me to get a clearer a picture…;-) Congratulations.